Large in length, slender to moderately robust bodied snake with a medium length tail. Can grow to a maximum of about 1.82 metres. Head is indistinct from neck with a prominent canthus rostralis. Eyes are medium in size with round pupils. Dorsal scales are smooth. Diverse range of habitats from wet and dry sclerophyll forests and heaths of the coast and ranges, through savanna woodlands to arid inland shrublands and grasslands. Particularly common in pasture and cropping regions of the eastern half of mainland Australia. Also found in urban and semi-urban areas. Diurnal and terrestrial snake with nocturnal tendencies in hotter weather. A swift moving snake with a more aggressive disposition than other species of the genus. If approached it will attempt to escape. If cornered it will hiss loudly, flatten the neck for a short period, then raise the forebody into an upright double S position and face the threat. Provocation or any approach too close will result in a rapid and snap like bite. Takes shelter in or under logs, abandoned animal burrows, deep soil cracks, under building materials and often found in and around farm sheds ( particularly hay sheds and grain silos which tend to attract mice ). Feeds mainly on small lizards ( particularly skinks, agamids and geckos ), frogs when available, mice and small birds. 2 to 6 mg ( dry weight of milked venom ), Meier and White (1995) ( Ref : R000001 ). 5 to 10 mg ( dry weight ), Minton (1974) ( Ref : R000504 ). Adelaide, SA : 2.9 ( 0.2 to 7.2, n = 25 ) mg ( dry weight of milked venom ), Williams et al (1994) ( Ref : R000749 ). 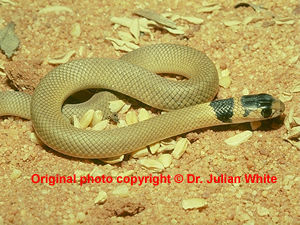 Goyders Lagoon, SA : 18 ( n = 1 ) mg ( dry weight of milked venom ), Williams et al (1994) ( Ref : R000749 ). Gold Coast, Qld : 10.8 ( 3.3 to 20.0, n = 16 ) mg ( dry weight of milked venom ), Williams et al (1994) ( Ref : R000749 ). 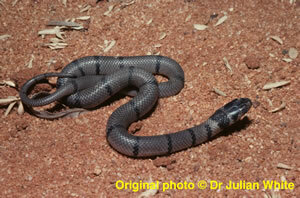 Adelaide, SA : 4.41 ± 2.97 ( n = 40 snakes, 2203 milkings ) mg ( dry weight of milked venom ), Masci et al (1998) ( Ref : R000989 ). 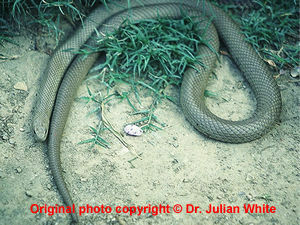 Gold Coast, Qld : 8.14 ± 6.87 ( n = 14 snakes, 541 milkings ) mg ( dry weight of milked venom ), Masci et al (1998) ( Ref : R000989 ). Variable non-specific effects which may include headache, nausea, vomiting, abdominal pain, diarrhoea, dizziness, collapse or convulsions. Early cardiac arrest possible and potentially lethal unless immediate effective resuscitation given. 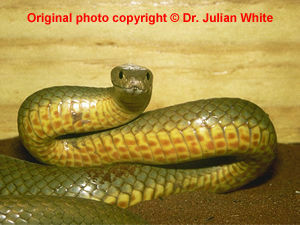 While most brown snake bites will prove minor, rapid lethal envenoming can occur, thus all cases must be assessed urgently. If there is systemic envenoming (coagulopathy or renal damage, rarely paralysis) give antivenom (number of vials required is reducing following ongoing clinical research).